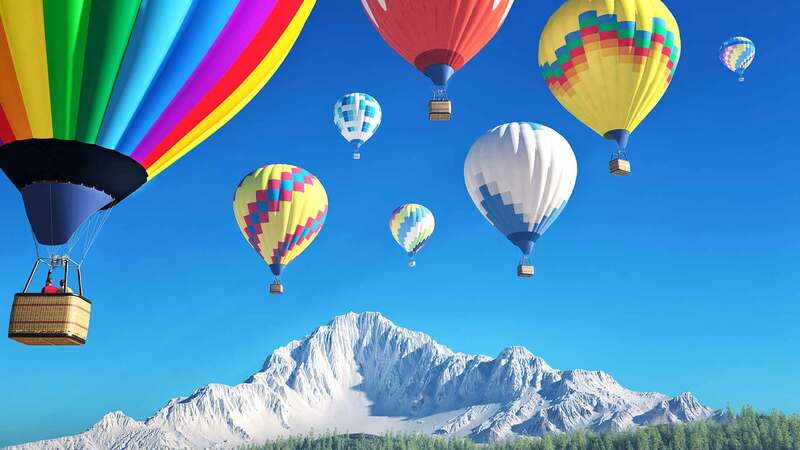 Gliding above the treetops in a basket with blue sky above, spectacular scenery below, and little more than the wind and a pilot to guide you: a ride in a hot air balloon can be an exhilarating experience. Hot air balloon rides are gaining in popularity all over the world and there are a variety of companies that offer rides in just about every region of the country. There are many factors that affect the length of a hot air balloon ride, but on average, rides last around one hour and generally take place at the two most picturesque times of day: sunrise and before sunset. Companies offer a range of rides, themes can vary from romantic, couples-only rides (perfect for popping the question!) to location-themed rides that fly over places such as Napa Valley, the Las Vegas Strip, etc. The price of your ride generally depends on the type of ride you choose and the number of people involved. Couples-only rides tend to be on the expensive side, but they often include extras, such as champagne and a commemorative photo. A regular group ride is less romantic but also less expensive and most companies charge less per person as the number of people in the group approaches the maximum riders allowed. For safety reasons, hot air balloon rides can’t take place during inclement weather or on days or times when it is too windy. Winds are calmest at sunrise or an hour or two before sunset, which is why rides are usually scheduled at these times. Because the weather will be the most important factor of your ride, there’s always a chance your ride may be cancelled. Most companies require you to call to confirm your ride the day before you’re scheduled to take off. If weather conditions aren’t favorable, they will reschedule you for another date. There’s more to the ride than the actual flight, so plan on setting aside three to four hours for the entire experience. The temperature during your flight will be about the same up in the air as on the ground; many places recommend dressing in layers, similar to what you’d wear on a hike (long pants and sturdy shoes are highly recommended). Depending on the size of the balloon and basket (also called a gondola), rides can accommodate anywhere from two to upwards of ten or more people, including the pilot. Once you arrive you’ll meet your pilot, who will explain in detail what to expect during your ride. You’ll then watch the assembly and inflation process, where the basket will be attached to the balloon and the balloon will be inflated (some companies encourage participation in this process, ask if you can help!). At a certain point, the pilot will start the balloon’s “engine” by lighting the burners, which will heat the air inside the balloon, ultimately causing it to rise. When the time’s right, the pilot will ask you to climb into the basket, and off you’ll go. How high you go will depend on your pilot and the wind conditions on the day of your ride. In general, you can expect a mellow, easy ascent where you’ll climb to about 1500 feet. Remember, you’ll be riding with the wind, so it won’t be windy in the basket while you’re in flight. As the flight path itself literally depends on which way the wind blows, no ride is ever the same twice. The pilot will “go with the flow” with that day’s wind currents and will decide where to land during your flight. Because of the size of the balloon, pilots need large spaces for a safe landing; they typically occur in wide, open fields a few miles away from where you took off. This is why many companies recommend wearing sturdy shoes and long pants: there’s always a chance you may land in a field where you’ll have to walk through long grass or other not-quite-paved, mother-nature-like conditions. The pilot isn’t the only member of your flight’s crew. While you’re gliding around in the air, your pilot will be in constant, subtle radio contact with a “chaser” crew who will be following your flight by van (or other such vehicle) on the terra firma of the streets below. The chaser crew will be waiting for you at the landing spot, ready to help deflate the balloon, disassemble the balloon and basket, and drive everyone back to the original starting point. A great way to determine whether you a hot air balloon ride is for you is to try a tethered balloon ride at a fair or publicity event. In a tethered ride, balloons are anchored and pilots simply fly the balloon up and down with passengers in tow. Rides are short and last just a few minutes each. Costs will depend on the event and are sometimes free. Check local listings for possible tethered balloon events in your area. Some companies may advertise a low hourly ride rate, only to hit customers with additional fees and taxes when it comes time to pay in full. Confirm the final price with your company when you make your reservation and ask if you will have to pay any additional fees at any time. Additionally, be wary of national certificates that claim to be accepted by balloon companies nationwide. Research these certificates thoroughly before you buy them and make sure that the local company you select for your ride does, in fact, honor and accept the certificate.